You are currently browsing the tag archive for the ‘Glasgow’ tag. The Search For Katie Morag Is Over. The search for Mairi Hedderwicke’s ” Katie Morag” is over. Glasgow schoolgirl, 7 year old Cherry Campbell, will play the part in Move On Up TV’s new live action series for CBeebies and BBC Childrens. As far as the writing is concerned, the casting of Mairi Hedderwicke’s diminutive heroine completes a saga which began for me on a wet Sunday in November 2011, on the day of the Scottish BAFTA awards. I was meeting in a coffee bar with Don Coutts and Lindy Cameron of Move On Up TV . They asked if I was interested in the possible adaptation of the popular children’s series, Katie Morag, written and illustrated by Mairi Hedderwicke. I advised them that I was a great fan of Mairi’s work , but that if the large number of episodes (it turned out to be 26) which needed to be written were to be successful, then they should consider using the Team Writing For TV method . My colleagues and I , Dr John Quinn, Dr Gill Jamieson and writer and actor Martin McCardie , have been developing the concept and practice of TWFTV through the module which we teach at University Of The West Of Scotland in Ayr . Over the past 5 years we have created a robust methodolgical approach to team writing which lays down a series of crucial production steps designed to ensure that the concepts of theme, tone and narrative coherence are successfully carried across the large number of episodes of a long running TV Series. Crucially, it requires ALL writers to be present at ALL storylining sessions, and for detailed beat outlines to be created by the the entire storylining team. All team members have access to all others scripts and beat outlines, and the entire final product is then passed through the hands of a single lead writer. The lead writer’s job is to unify the entire process and reconcile production, narrative, and executive notes in order to create a coherent shooting script. I am delighted to report that under the stewardship of Lindy and Don, along with lead writer Sergio Casci, and Script Exec Angela Galvin of the BBC, the Katie Morag team have now brought the entire 26 Episode arc to a level ready for the production to go into principal photography at the end of April 2013. It is no mean feat to successfully bring such a large scale project to fruition in such a relatively short time. I think that the Broadcasters should feel indebted to Lindy and Don for whole-heartedly embracing the TWFTV process . At times it would have been much easier, (and certainly less expensive) to just send out spec outlines to a series of unconnected writers, but they held to the plan , and I am confident that the final product will reflect this coherent approach. 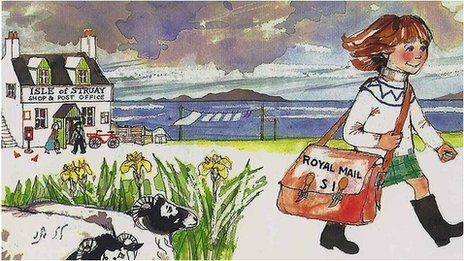 Katie Morag is Produced by the Move On UP team of Lindy Cameron, Margaret Mathieson and Donald Coutts. Donald Coutts will also direct all 26 episodes. Apart from myself, the series was scripted by writers Sergio Casci, Martin McCardie , Jan Storie & Louise Wyllie. Huge thanks also due to BBC’s Producers & Execs Angela Galvin, & Sarah Harkins . Angela was a key mover in the Team Writing Process, acting as the executive link between the writing team and the broadcasters and deserves huge credit for her role. Katie Morag starts shooting in Lewis at the end of the month. I wish the entire team, the newly cast actors, and especially Cherry Campbell all the very best for a successful shoot. We should see all 26 Episodes on CBeebies towards the end of the year. University Of Glasgow is currently recruiting 18 postgraduate research students across the UK in order to contribute to a research project commissioned by the Higher Education Academy to evaluate the Postgraduate Research Student Experience Survey (PRES). The work will be coordinated by Dr Lorenzo Vigentini and Barry McCluckie at the University of Glasgow and will provide important data for the evaluation and revision of the PRES. 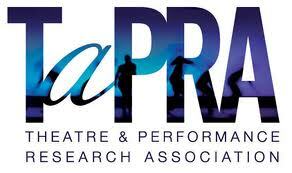 will contribute in all aspects of research and the exploration of key themes. You will need to be familiar with remote communication tools (i.e. Skype or Google hangouts), comfortable with office applications, and have an inquisitive mindset. For any question or doubt please contact the project lead Dr Lorenzo Vigentini (Lorenzo.Vigentini@glasgow.ac.uk). Special mention was made by many afterwards on Andrew McIntosh performance in ‘Your Number’s Up’, (so versatile some folks didn’t realise he also played Mad Mitch!) John McQuiston in ‘The things we do’ and Lucy Goldie in ‘See you in my dreams’; but as I say I could go on on on and it took ALL involved to get all the films to screen! There are also a heck of a lot of winners behind the scenes and I’d like to thank just a few of them here in particular, but a huge thanks to all of you who make WCA! constructive, motivational and fun throughout the year – Support Home Grown!So, a HUGE THANK YOU to the fantastic work and dedication behind the scenes to pull the event together from (in particular, and in no particular order!!!) Cheryl Belcourt and Mark Loftus for fantastic support & skills work throughout the year culminating in the nights event – our host venues CCA who support us all year long with fantastic work spaces and liason with Events ManagementArlene Stevens, and last nights amazing platform to showcase our Screening & Awards night at Cineworld! liasing with Lisa Henderson Manager and the Duty Manager Helen and staff on the night kept up the excellent support. Event specific Teams of Charlie Francis and Colin Ross Smith who managed the dvd compilations of screenings and ‘what WCA does’ – Interviewers from FLICKER magazine Sean Wilkie and Melanie, our Event Photographer Chini Obiechina – Event Assistants Kyle Spence, Katie White and Anna who put up with my hissy fits in the run up –Isla McTeerwho done all our lovely posters, flyers and tickets and Katie White for the amazing Awards that are now adorning your walls and putting a smile on yer face when you see it and think ‘I won that’ and deservedly so! Lastly, a huge thanks to all the folks who came along to support Home Grown Talent, and to the Industry Judges who took time out from their busy schedules to watch the films and vote;Lizzie Gray, Bernard McLaverty, Eleanor Yule, Martin McCardie, Alan de Pellette, Nick Farr & Derek Morrison, and those who voted but were also able to attend the event to support and network in person; Zam Salin, Stuart Hepburn, Karen OHare & Dale Corlett. Big thanks! 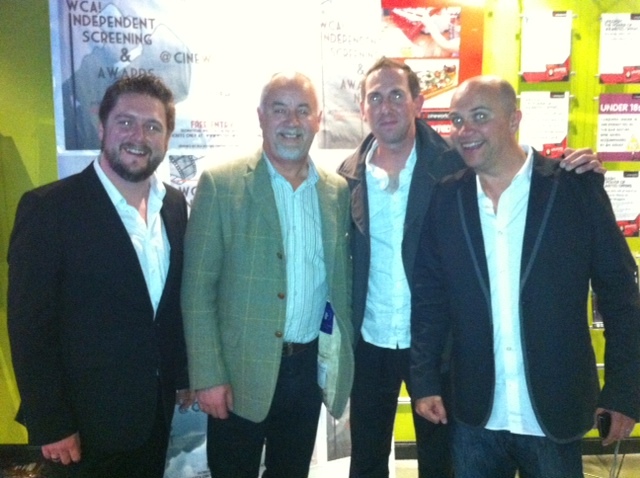 UWS Students Triumph At FilmG Short Film Awards. 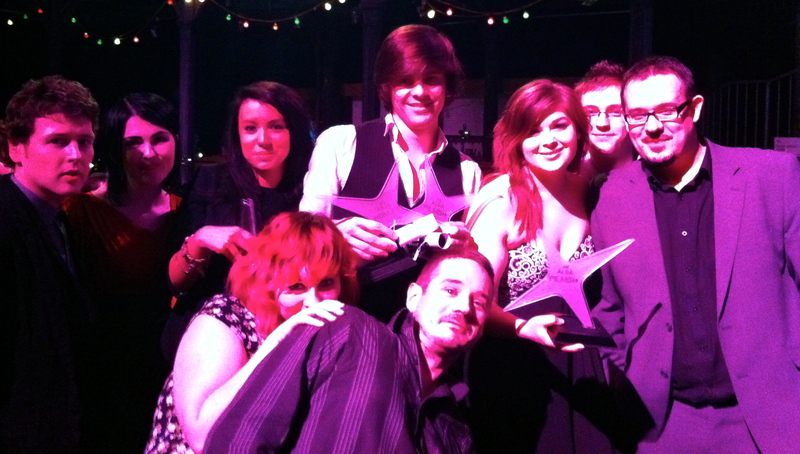 Rachel Kennedy, Sam Love, Daniella Ritchie, John S Caldwell, James Todd and the team celebrate their wins. Contemporary Screen Acting students from University of the West Of Scotland won three awards at the FilmG Gaelic shorts award ceremony at Glasgow’s Fruitmarket Gallery last night. MG ALBA , the Gaelic Media Service have created the FilmG short film competition in order to foster and encourage film makers in the gaelic medium. Our student’s five minute film An Aite Eader na Facail (The Space Between Words) won Best Director, Best Drama, and the People’s Award. The film was created as part of the fourth year Screen Drama module, where students are tasked with creating a five minute film . This is a Cross Programmatical module where Directors, Writers, Actors and Musicians can all be assessed through their specialisations. Although 7 other films were created this year, because one of our students , Rachel Kennedy, is a native Gaelic speaker, this student team decided to make their film in the Gaelic medium and to enter it into the annual FilmG Competition. All this bore fruit at the Fruitmarket last night as they won three awards, including Best Drama. Special praise should go to Director Of Photography , John S Caldwell, whose Black Pepper Studios provided all the post production facilities. Below you can see the full list of prize winners, and the films can be accessed by clicking on their titles. A lot of Scottish Film makers have embraced the ethos of WriteCameraAction and gone on to form collaborations and get those ideas which were originally workshopped at WCA actually produced – Well Done! 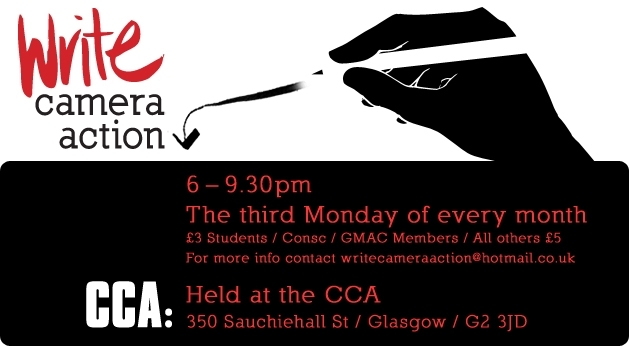 With the support of their host venue the CCA in Glasgow, Linda Campbell is now organising an event to showcase films that have been workshopped or have collaborated with WCA prior to their production. At this early stage what she is looking for is an indication of how many of these films are out there and a little of their history. The script of the work produced must have been workshopped either in whole or in part at WriteCameraAction in a monthly WCA or an advanced WCA workshop booked by Linda, AND/OR have some collaboration directly with WCA that contributed to the work being produced. It must be a no-low budget production e.g. not funded by a public body (no Student Graduation films) That’s it!!! The rest is detail: You should say what the Title of work is, genre, duration, brief synopsis, and brief history of ‘idea to fruition’ e.g. Did you utilise the WCA mailshot, did you cast from participants cast during your workshop or seen at another performance at WCA etc. or not. Who were your crew and did you meet them through networking via WCA or not. Has it been shown anywhere else e.g. Film Festivals, GMAC, Youtube… That’s it. More than one entry is not only allowed, it’s applauded! No limit to the number of films you enter as long as they fulfill the criteria. If you have a work in progress send Linda the details if it’s likely to be completed in the next few months. Please note: Do NOT send any films at this stage. Linda expects to see varying standards of production values so don’t let that put you off – Write Camera Action is about supporting and developing Home-Grown Produce! !